You've chosen WordPress for your website and the next choice will inevitably be which theme to use. A WordPress theme affects the 'look and feel' of your website. It will determine link colours, navigation menus, typeface, page layout and much more. The world of themes is always changing and there are many choices to be made. This guide will hopefully answer some of your questions. As WordPress specialists ZCT Media have seen all types of themes in use and there's a case for each type too. This page should inform you of the different types from free to custom. WordPress comes with a basic theme and there are many free and premium (paid for) themes available. There are also custom WordPress themes, which are our speciality. There are advantages and caveats to each type. Recently, Page builders have been crossing over into the world of themes and this makes for yet more possibilities. The official free theme is named after the year of release. This free theme is fine whilst your adding content and building your site up but your site will look like literally millions of others. There are many free themes available from the 'add new' repository and some look really good. However, the provenance is difficult to prove and many become forgotten projects. This could mean that one day they just don't work or worse. These themes are paid for themes with a support structure. They usually have a purchase price and a support subscription. Popular vendors of these are Theme Forest, Code Canyon and Elegant Themes. We have used and installed many themes from all of these sources and there are clear advantages and disadvantages with them. You get a great looking site fairly quickly and there is a good deal of customisation possible with the top themes now. The first bump you experience is the imagery in the 'showroom model' is usually first class. Without good imagery they can look quite basic. So either begin with some good imagery or buy some stock photos. The other disadvantages are more subtle and occur later down the line. The top premium themes such as Divi, X and Enfold have many customisable options - so many that you feel like you're having to learn to develop the theme... This may not be what you wanted when you signed up. That £50 theme is now demanding days of your time and the total cost of ownership is starting to grow and grow. You could just use it out of the box but it will look like the thousands of other sites built with these popular themes. The second issue you may face is if you want to change the theme. These themes use a system of 'shortcodes' which will look like [this text in this box]. Switch off the theme [and these things] will be absolutely everywhere throughout your site. All the things they did will be gone and you will be back at square one - after you've deleted all of them of course. Another issue is speed. Some have all of these options behind the scenes but they still bloat the code and make the site load slowly. No-one likes that! It has to be said though, all things considered, they can be a great route to a quick, modern, great looking site. Just choose the right one, have some brilliant imagery ready and be prepared to stick with the theme. Oh, one more thing... make sure you've got a couple of days free, or maybe a week or three. There is a crossover now in that premium themes have so many customisation options that it could be argued that they become custom themes. Once you get into editing all of the options you start to become a 'developer' whether you like it or not. A purely custom theme though is one that is made for you. It will be as unique as a website can be and that is it's major advantage. Your competition won't be able to buy the same thing out of a box and it will have page layouts just like you want. You'll also have the luxury of telling the designer/developer just how you want it and you won't have to work out how to do it! Some are hand coded to your specification. We don't do that. There's no way that hand coded is not a vulnerability. There isn't the economics of scale for the developer to keep on ensuring that the theme keeps up with the regular updates to WordPress. Worst of all is that you're dependent on the programmer for any edits. Most developers are nice people but the fact is that in this situation they have you over a barrel. Then there's the possibility of them moving company or the company going out of business. If you can live with the caveats and you have the money you will get exactly what you want though. We use child themes. Matt Mullenweg (The inventor of WordPress) recommends this route. Our child themes sit on Genesis, the industry standard WordPress framework. This route is also endorsed by Matt. If you choose to move away from our theme it will be fairly painless and your content will still work. Updates are covered by the parent theme so if anything were to happen to us you'll still be covered. Page builders have had a bad name in the past for good reasons but they are not all the same. If you use ZCT Media we'll show you the Page builder we use. It's not for everyone but it's a money saving game changer for some clients. There is a degree of cross-over as to whether they are theme builders but this area is changing all the time and for the better mostly. Have a chat, we're following this very closely. So there you go. There are good reasons for all of these themes and things to bear in mind. If you'd like a free quote on a custom theme get in touch for a chat. A WordPress theme affects the 'look and feel' of the website. It will determine link colours, navigation menus, typeface, page layout and much more. It's analogous to the body of a car where WordPress is the engine. Sometimes they are referred to as 'templates'. WordPress comes with a basic theme and there are many free and premium (paid for) themes available. There are also custom themes, which are our speciality. There are advantages and caveats to each type. The official free theme is named after the year, currently twenty sixteen. This free theme is fine whilst your adding content and building your site up but your site will look like literally millions of others. Free themes. 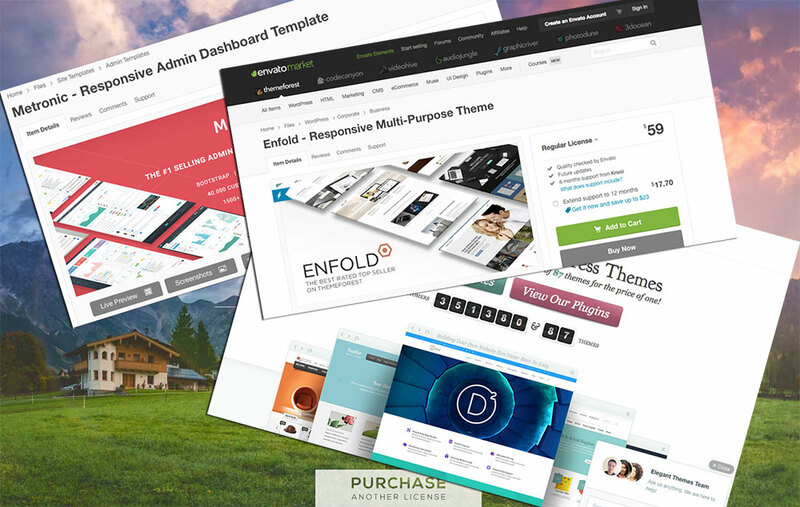 There are many free themes available from the 'add new' repository and some look really good. However, the provenance is difficult to prove and many become forgotten projects. This could mean that one day they just don't work or worse. Premium themes. These themes are paid for themes with a support structure. They usually have a purchase price and a support subscription. Popular vendors of theses are Theme Forest and Elegant Themes. We have used and installed many themes from these sources and there are clear advantages and disadvantages with them. It has to be said though, all things considered, they are a great route to a quick, modern, great looking site. Just have some brilliant imagery ready and be prepared to stick with the theme. Oh, one more thing... make sure you've got a couple of days free, or maybe a week or two. Custom themes. There is a crossover now in that premium themes have so many customisation options that it could be argued that they become custom themes. Once you get into editing all of the options you start to become a 'developer' whether you like it or not. A purely custom theme though is one that is made for you. It will be as unique as a website can be and that is it's major advantage. Your competition won't be able to buy the same thing out of a box and it will have page layouts just like you want. You'll also have the luxury of telling the designer/developer just how you want it and you won't have to work out how to do it! We use child themes. Matt Mullenweg (The inventor of WordPress) recommends this route. Our child themes sit on Genesis, the industry standard WordPress framework. This route is also endorsed by Matt Mullenweg. If you choose to move away from our theme it will be fairly painless and your content will still work. Updates are covered by the parent theme so if anything were to happen to us you'll still be covered. Page builders have had a bad name in the past for good reasons but they are not all the same. If you use us we'll show you the Page builder we use. It's not for everyone but it's a money saving game changer for some clients. There is a degree of cross-over as to whether they are theme builders but this area is changing by the month. Have a chat, we're following this very closely. So there you go. There are good reasons for all of these themes and things to bear in mind. If you'd like a free quote on a custom theme get in touch.